Produktinformationen "If This is A Woman"
The compelling story of the only concentration camp for women by the acclaimed author of A Life in Secrets .Winner of the Longman-History Today Book Prize 2016On a sunny morning in May 1939 a phalanx of 800 women - housewives, doctors, opera singers, politicians, prostitutes - were marched through the woods fifty miles north of Berlin, driven on past a shining lake, then herded through giant gates. 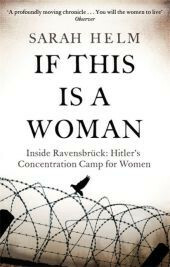 Whipping and kicking them were scores of German women guards.Their destination was Ravensbrück, a concentration camp designed specifically for women by Heinrich Himmler, prime architect of the Nazi genocide.For decades the story of Ravensbrück was hidden behind the Iron Curtain and today is still little known. Using testimony unearthed since the end of the Cold War, and interviews with survivors who have never spoken before, Helm has ventured into the heart of the camp, demonstrating for the reader in riveting detail how easily and quickly the unthinkable horror evolved.Compelling . . . [Helm] has painstakingly sought out many survivors and talked to them herself. The results are devastating . . .What one is left with at the end of this momentous book is a sense of the power of human nature, both for good and evil Independent on SundaySarah Helm arbeitet als Journalistin und Autorin in London.